Ask Me Anything About IELTS - Click To Whatsapp Jonathan Now! Click To Get Jonathan's IELTS Class Schedule And Fees Now! Hi, I'm Jonathan. Some of you may know me as the IELTS teacher in Singapore who has helped hundreds of students pass their IELTS exam. Let me tell you a bit more about myself. Qualified English Teacher - I have a University of Cambridge CELTA teaching qualification and have completed half of my Master of Education in English Teaching. 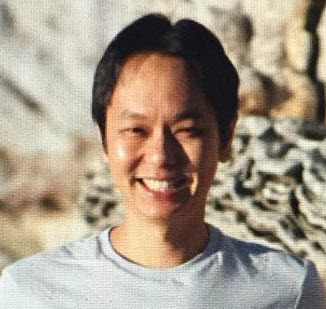 Taught In 4 Countries - I've lived most of my life in Singapore and Australia and have taught English in both countries - and also in China and Colombia (South America). Specialize in IELTS Preparation - While I've been teaching English since 2003, for the past 5 years I've been specializing in teaching IELTS. Because of this, I've become familiar with every aspect of the IELTS exam. 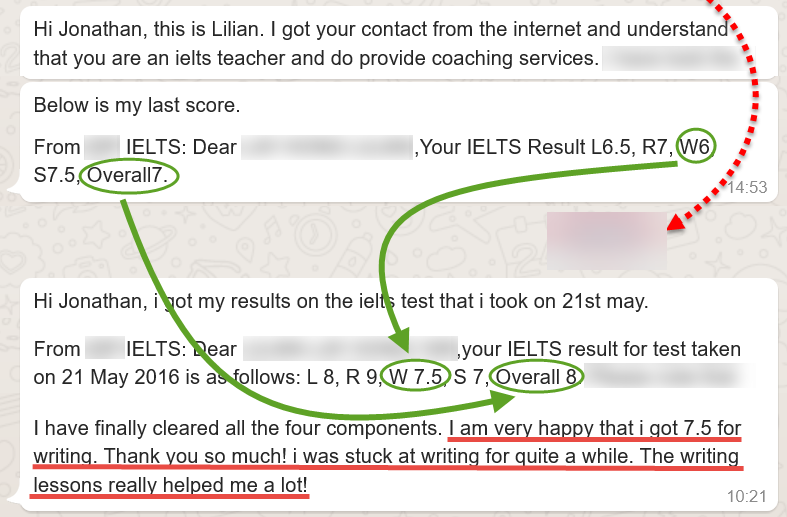 Unlike many teachers who teach many levels and types of English exams (and thus can't possibly teach as well in all of them), I only focus on IELTS. 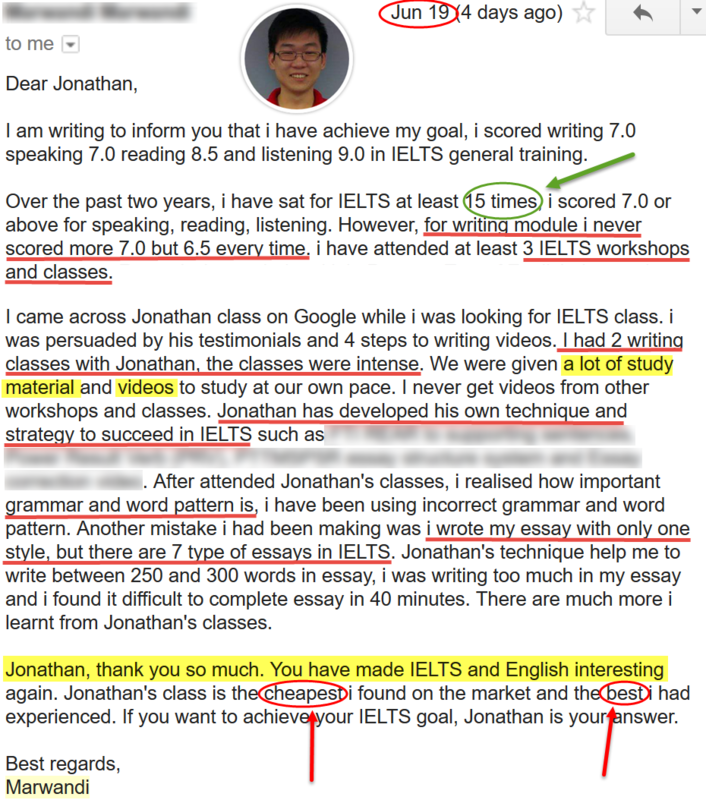 What Makes Jonathan's IELTS Classes So Different? MY STUDENTS' SUCCESS: To me, the most important thing is to help my students get the results they need. And I've helped a lot of them succeed over the years. Click --> here <-- to read over 280+ real testimonials. No hype - just real people with real testimonials! AFFORDABLE CLASS PACKAGE: My Class Package (see below) consists of a total of 36 hours for $500 - less than $14 per hour! You won't get that sort of price per hour in any other classes in Singapore! My classes are definitely the cheapest in Singapore for the enormous value you get. DETAILED NOTES: Through my many years of teaching IELTS students, I've created very detailed notes (especially for Writing) to help my students. My students have found the notes (over 200 pages for all 4 sections) extremely beneficial and useful for their self-study and preparation for the exam. You can be sure that you'll never find such notes anywhere else - these notes are one of the reasons for the success of my students. RARELY-TAUGHT TECHNIQUES: While I cover all four components of the IELTS exam (Listening, Reading, Writing and Speaking), most students struggle the most with Writing. Therefore, I've spent a lot of time improving my teaching in this area, developing strategies and techniques seldom taught elsewhere (and developing my own unique ones) that have helped my students greatly improve their Writing. PERSONAL TOUCH WITH THE TEACHER: You'll be communicating with me through email and phone. You'll have my number and direct access to me - you don't have to go through a school or an administrator. I don't think any other teachers give their students their own personal number. You see, I'm not working for a school and teaching is not just my job. It's my passion and I like to help my students achieve their desired score. That's why I am constantly improving my notes, my teaching materials and my teaching skills and you have direct access to me. PERFECT TIMING FOR WORKING ADULTS: My classes are held on the weekends - Saturday (1pm to 5pm or 6pm to 10pm) or Sunday (9am to 1pm). This timing is great as it can accommodate most working adults and students. INTENSIVE CLASSES: Whether you're looking for quick short-term classes or you want to study over a period of a few months, my classes are great for you. 1) If you need to prepare quickly, then all you need to do is attend 4 Saturday or Sunday classes (over a period of 22 days only). My teaching is very intensive and detailed and you'll definitely learn a lot and be prepared within a short period of time. 2) If you want to take a bit more time, my classes will provide you with a lot of material for you to study over a few months. Not only are there 4 classes, but there are also over 20 hours of videos and over 200 pages of unique materials that you can use for your self-study over many weeks or months. Do You Really​ Need IELTS Preparation Classes? 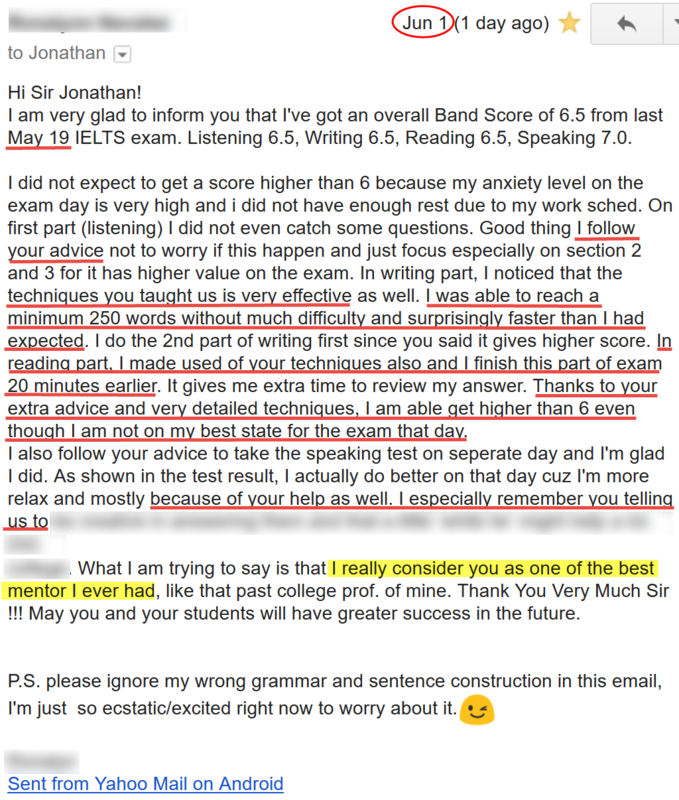 So many of my students have told me after just attending 1 of my classes, "Jonathan, I wish I got to know about your IELTS classes a long time ago." Why do they say this? Most of these students either failed their exam before because they didn't prepare properly for it or they attended other IELTS classes which didn't really prepare them much and thus they failed their exam. Do you know that the cost of taking the IELTS exam is more than S$300? If you take your IELTS exam and fail it, you would have wasted S$300. One of my students (see below) took the exam 15 times over 2 years before enrolling in my class. 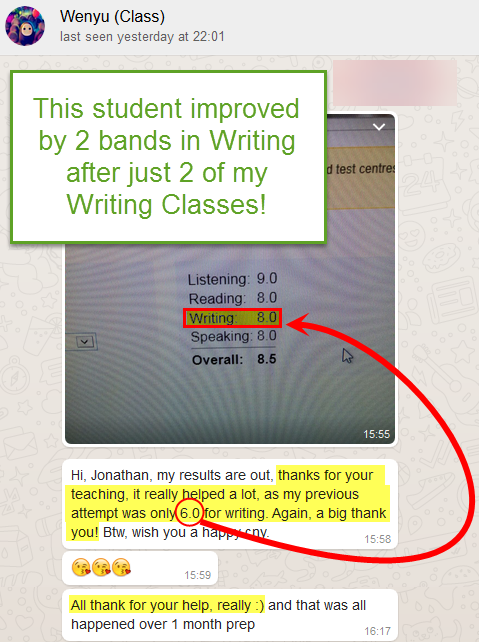 He never got 7.0 for Writing in his previous 15 attempts, but he did get 7.0 after attending just two of my Writing classes. 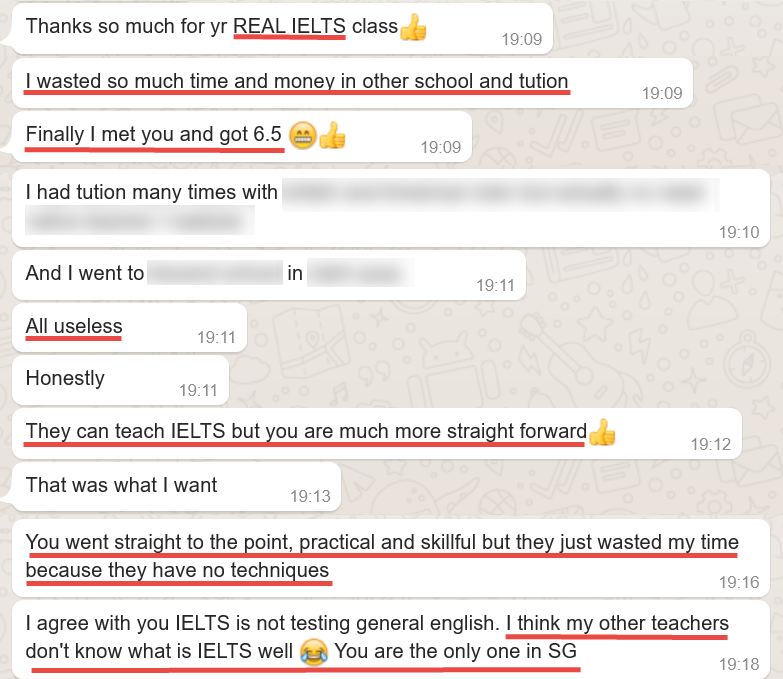 If he attended my IELTS classes 2 years ago before he took his first IELTS test, he could have possibly saved about S$5000 (that's how much 15 IELTS exams cost!) and 2 years of his life! What's the moral of the story? Please don't make the mistake of trying to save a bit of money by not attending IELTS preparation classes! In the end, you could end up wasting a lot more money and time! My IELTS preparation and review class is already one of the cheapest classes in Singapore - if not the cheapest. And it is definitely the best in terms of the value you get! Whether you're taking your IELTS exam at British Council or IDP, and whether you're taking the Academic or General Training IELTS, make sure you're prepared! 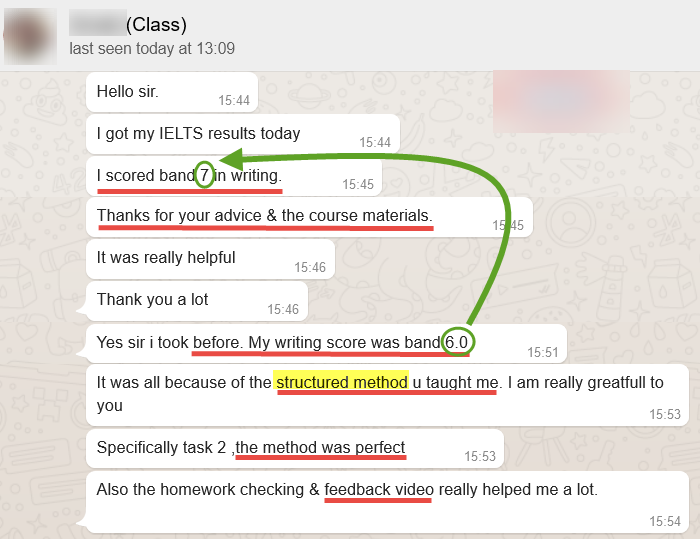 As you can see from the above student testimonials, when you attend my classes, what you're getting is an IELTS teacher with vast experience and one that produces consistent results. You can't go wrong with my classes. If you're serious about preparing for your IELTS exam, click the button below to get more information about registering for my IELTS classes. Get Jonathan's IELTS Class Schedule & Fees Now!